30 | October | 2004 | CRASHCAM FILMS - news & etc. 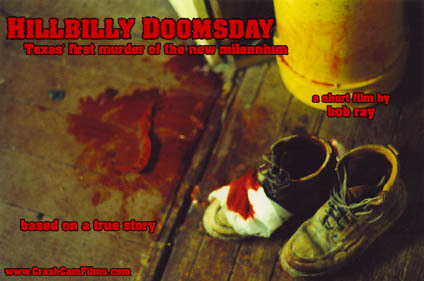 Hillbilly Doomsday is an extremely dark and comedic tale of Texas’ first murder of the new millennium. December 31, 1999, rural East Texas. With Y2K paranoia at a fevered pitch, two drunken hillbilly brothers hole up in their wooded shack and await the year 2000. The second hand strikes midnight, the power shuts off and suddenly the brothers’ nightmarish Y2K fears are realized. Certain that the apocalypse is upon them they hastily formulate a plan to prepare for the bleak and uncompromising future. What follows is the brutally funny, heinously violent and nearly botched murder of their survivalist cousin who they kill in an effort to steal his guns and provisions and to make ready for the new post-apocalyptic world of the future. 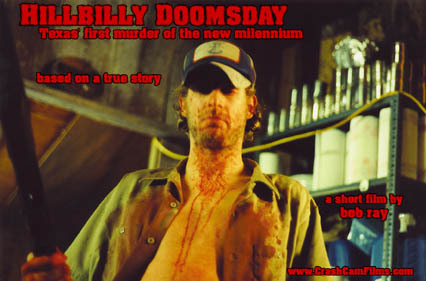 Hillbilly Doomsday was shot with a cast of 3 and a crew of 4 in late 2000. Soon after production wrapped, the footage was lost and remained in limbo for over three years. After re-discovering the master tapes in late 2003, Hillbilly Doomsday was cut together as ntended and is finally being unleashed upon the world. Hillbilly Doomsday features Jerry “Toe” Clark of “Rock Opera” fame, Michael Dalmon and Mark Hanks and is written and directed by Bob Ray.